A FieldServer protocol gateway that provides data exchange between GE-SRTP and BACnet IP. The QuickServer is a high performance, fully configurable, cost effective Building and Industrial Automation gateway for integrators to easily interface devices to networks in commercial buildings and industrial plants. The Classic QuickServer is a high performance, fully configurable, cost effective Building and Industrial Automation gateway for integrators to easily interface devices to networks in commercial buildings and industrial plants. The GE-SRTP driver allows the FieldServer to transfer data to and from devices over Ethernet using GE-SRTP Driver protocol. The BACnet/IP driver allows the FieldServer to transfer data to and from devices over Ethernet using BACnet/IP protocol. The FS-QS-1X10 Series is preloaded with two BAS drivers (two RS485 serial ports and one Ethernet port) Drivers from a list of over 150 protocols. There is a basic QuickServer that can handle up to 250 points and an enhanced QuickServer that can handle 500 points. The FS-QS-1220 Series is preloaded with two BAS drivers (one RS485 serial port, one RS232 serial port, and one Ethernet port) Drivers from a list of over 150 protocols. Each QuickServer can handle up to 500 points. The BACnet/IP driver allows the FieldServer to transfer data to and from devices over Ethernet using BACnet/IP protocol. The FieldServer can emulate either a Server or Client. All information in a BACnet system is represented in terms of objects. The Object_Identifier is a 32-bit code that identifies the type of Object (also identified by the Object_Type Property) and its "Instance" number, which together uniquely identify the Object within its BACnet device. Theoretically, a BACnet device could have over four million Objects of a particular type. The Object_Name is a text string, which has a unique capability. BACnet devices may broadcast queries for devices that contain Objects with a specific Object_Name. This can greatly simplify project setup. 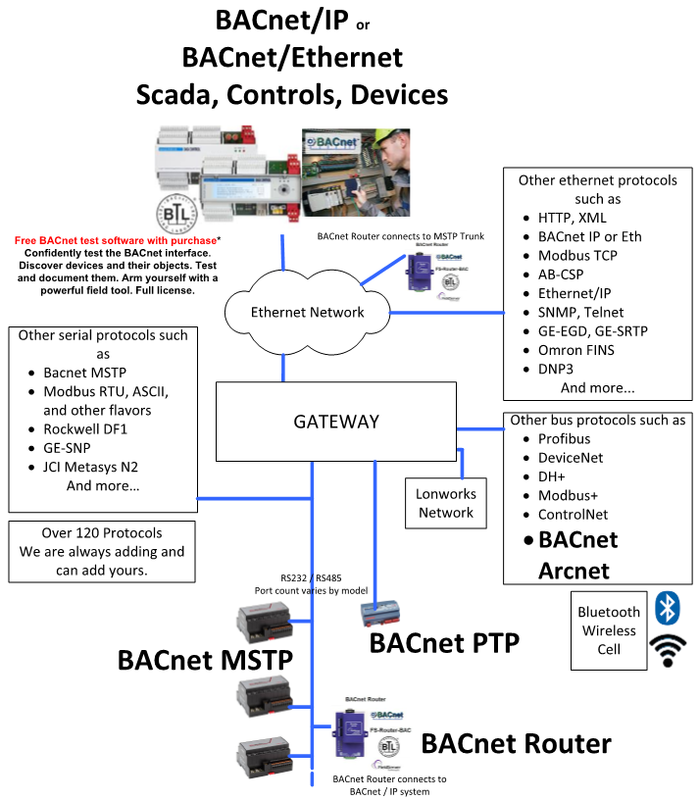 BACnet requires one Device Object to be present in every BACnet device. The Device Object makes information about the device and its capabilities available to other devices on the networks. Before one BACnet device starts control-related communications with another, it needs to obtain some of the information presented by the other device's Device Object. Unlike other Objects, the Device Object's Instance number must be unique across the entire BACnet internetwork because it is used to uniquely identify the BACnet devices. It may be used to conveniently identify the BACnet device from other devices during installation. Standard object types are used to hold real time data and other information. Each Object Type is referenced by a number, for example 0 represents an Analog Input. See Appendix D.1 for abbreviation list. Each Object consists of a number of prescribed properties, the main property being the Present_Value. Objects are monitored and controlled through their properties. System integrators world-wide have benefitted from the value of the powerful line of interoperability gateways offered by FieldServer. Now, QuickServer adds to that value by running the same robust FieldServer protocol conversion software on a highly cost effective platform backed by the experience, engineering expertise and proven technical support that integrators have come to expect from FieldServer. The QuickServer FS-QS-2X10 series is available at four different point capacities. Each QuickServer is preloaded with two drivers (serial and/or Ethernet) from a customer’s choice of 140 different drivers, E.G. 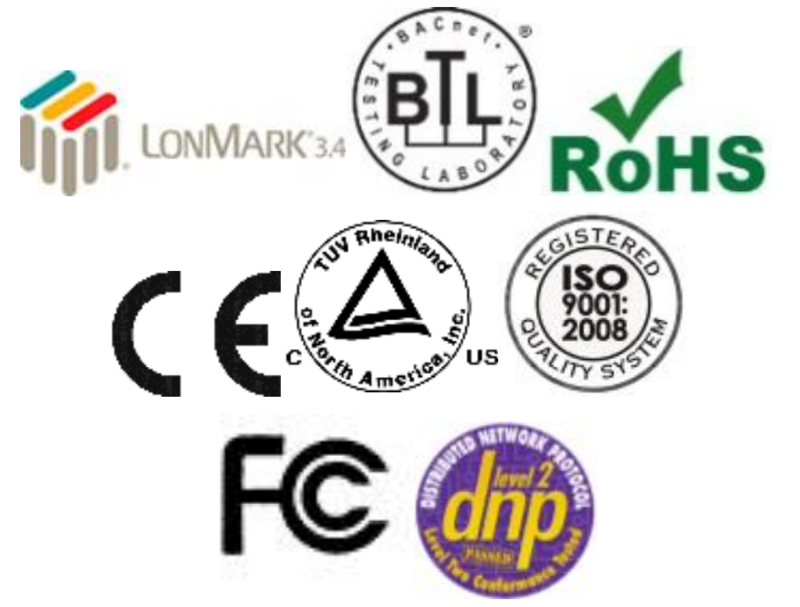 Modbus, BACnet, SNMP, EtherNet/IP and many more. The FS-QS-2010 with 2 RS485 and 1 ethernet port can support up to 250 points. The FS-QS-2210 can support up to 500 points. The FS-QS-2310 can support up to 3,000 points. The FS-QS-2410 can support up to 5,000 points. Equivalently the FS-QS-2020 with 1 RS485, 1 RS232 and 1 ethernet port can support up to 250 points. The FS-QS-2220 can support up to 500 points. The FS-QS-2320 can support up to 3,000 points. The FS-QS-2420 can support up to 5,000 points. Every QuickServer includes browser-based tools to make it easy to set-up QuickServer and perform diagnostics including determination of status, network settings, node information, map descriptors and more. The USB flash drive also includes the Discovery utility to determine what FieldServers are on a network. The GE-EGD (Ethernet Global Data) driver allows the FieldServer to transfer data to and from devices over Ethernet using GE-EGD (Ethernet Global Data) protocol. The FieldServer can emulate either a Server or Client. 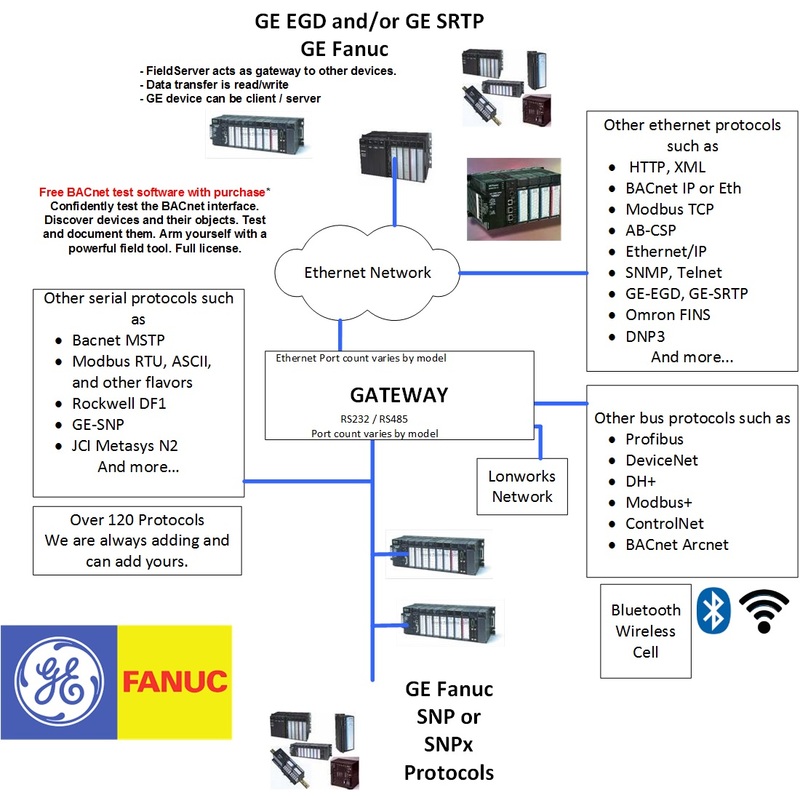 GE Fanuc Automation and GE Drive Systems developed an Ethernet Global Data, or EGD, exchange for PLC and computer data in 1998. EGD uses UDP or datagram messages for fast transfer of up to 1400 bytes of data from a producer to one or more consumers. UDP messages have much less overhead than the streaming TCP connection used for programming or CommReq’s over SRTP Ethernet. Like Genius® broadcast input or directed control messages, UDP messages are not acknowledged. They can be sent at short intervals. Chances of one or more messages being dropped are small on a local area network. As a Client the FieldServer acts as an EGD consumer. As a Server the FieldServer acts as an EGD producer. The IC697CMM742 Ethernet module supports both GE SRTP and GE EGD. 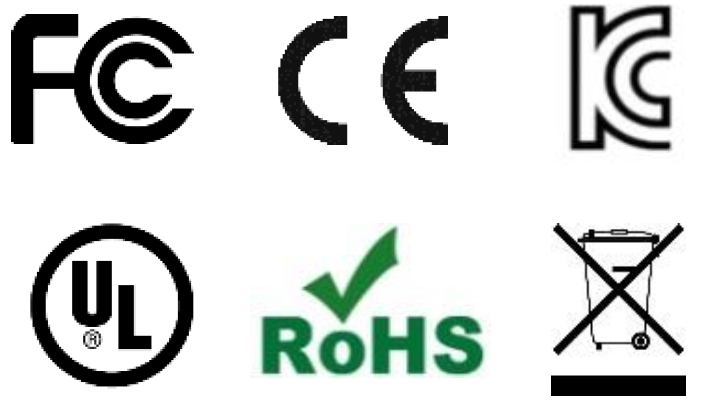 Depending on what hardware you require, the specifications will contain different options. For Example, M-bus section is only available on the FS-QS-1x50/FS-QS-1x51 devices where x is A for 16 devices, B for 32 devices and C for 64 devices. See images below for Port Support and product code check.